Each week Miss Halstead, our intrepid reporter (and head teacher), goes out and about around school looking for all the latest news. Miss Halstead has been thrilled this week to see all the wonderful work being done during Lent. In Class Three she saw the Stations of The Cross which she had to share with you – the art work is a real testament to the artists but also clearly celebrates God’s precious gift to us. As we spend the weeks leading up to Easter we will be thinking more and more about how God’s gave His Son, Jesus, to be our Saviour. Such love is everlasting and we really feel that you can see that love in these paintings. 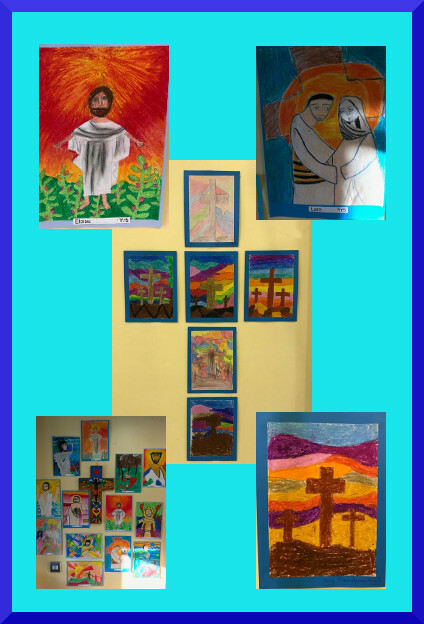 The work doesn’t stop in Class Three though, there are beautiful pieces of art all around the school; everywhere she walked, Miss Halstead was reminded of God’s Gift and the promise that Easter gives to us all. We are happy to share the work here but why not visit us at Celebration Assembly and see it in real-life?